A new polymer capable of supporting 1,000 times its own mass could soon change the world of medicine and fashion forever. The material can be stretched to a temporary shape, and hold that shape until heated to just above room temperature. 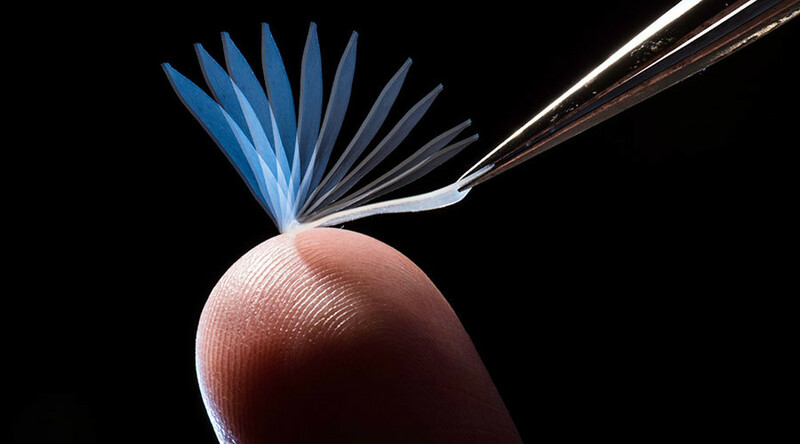 The 'shape-memory polymer,' developed by researchers at the University of Rochester in New York, can be stretched and manipulated into a new shape, which it will hold until it comes into contact with body heat, or any temperature of 35 °C (95 °F) or more. At that point, it will return to its original formation. "Our shape-memory polymer is like a rubber band that can lock itself into a new shape when stretched," study leader Mitch Anthamatten, a professor of chemical engineering, said in a statement. "But a simple touch causes it to recoil back to its original shape." To develop the polymer, Anthamatten and his team examined the crystallization that occurs when the material is cooled or stretched. “As the material is deformed, polymer chains are locally stretched, and small segments of the polymer align in the same direction in small areas—or domains—called crystallites, which fix the material into a temporarily deformed shape,” the press release states. As the number of crystallites grows, the polymer shape becomes more and more stable, making it increasingly difficult to revert back to its original shape. That's where the temperature trigger comes into play. The researchers were able to include molecular linkers to connect the individual polymer strands. They realized that they linkers inhibit – but don't stop – crystallization when the material is stretched. By altering the number and types of molecular links used, the scientists were able to adjust the material's stability and set the melting point at which it would revert back to its original shape. The mechanical work is indeed impressive: when contracting, the polymer can lift an object 1,000 times its weight. To put that in perspective, a polymer the size of a shoelace – which weighs about a gram – could lift a liter of soda. A video released by the university shows the polymer's ability to pull a toy truck up an incline and lift a weight. It also shows its reaction to heat, moving to crush a dried seed pod when placed under a light. Anthamatten believes the shape-memory polymer could have a variety of uses in the world of medicine, including artificial skin and body-heat assisted medical dispensers. It could also revolutionize the world of fashion, potentially being used to make self-fitting apparel.